Jesse loves Red Lobster’s biscuits. He’ll repeatedly ask the servers to refill the bread basket about oh, a minute after it arrives at the table. I thought it would be nice if he could enjoy these garlicky cheese biscuits at home without having to beg for refills from annoyed looking staff. Red Lobster style biscuits can be copied using Bisquick, but I don’t like to purchase baking mixes for just one recipe. Instead I combined Todd Wilbur’s copycat version from Top Secret Recipes with "Oil Drop Biscuits" from Joy of Cooking. They turned out pretty close to the real ones without much extra effort. No Bisquick needed. Place the oven rack in the middle position and preheat to 475 degrees. Line parchment paper on an Airbake cookie sheet. Double up two cookie sheets together if you don’t have an Airbake. Stir with a fork just until the dough readily leaves the sides of the bowl. Scoop the dough with a cookie scoop and drop two inches apart on cookie sheet. Bake 10 to 12 minutes (watch carefully near the end) or until lightly golden brown on top. Immediately, liberally brush all the melted butter mixture over tops of biscuits. Serve hot. Makes 9 biscuits with a size 16 (1/4 cup volume) scoop. Recipe created from two sources, Drop Biscuits with Oil from "Joy of Cooking" and Red Lobster Biscuits from "Top Secret Restaurant Recipes 2", by Todd Wilbur. Picture by Laura Flowers. These sound really yummy. I'm with you on not wanting to buy the bisquick for just one recipe. I'm grateful you figured out a copycat version without it. Thanks!!! These biscuits or renditions of these biscuits have been popping up everywhere. I'm so glad you didn't use Bisquick. I don't buy it either. This looks sooo good. The Red Lobster style bisucits look amazing. I would hardly be able to contain myself- I love biscuits. Those look about 10,000 times better than anything Red Lobster ever made. Beautiful biscuits and photography. I've always wanted to make these from scratch. I used to eat a ton when I used to go to Red Lobster. Oh my little sister will KILL me if I tell her you posted this and do not make them for her when she comes to visit soon! Laura, I will make them tomorrow. These biscuits are my favorite too. I don't like to go to Red Losters because I will eat 4 biscuits! This is a great recipe, easy for me. Thank you so much for posting yummy easy to make food. I'm not sure what the Red Lobster is, but they sound delicious! Great work tweaking tose recipes. I've never had these but am shameless when it comes to anything biscuit like. Mmmmm....warm out of the oven you just can't beat them. Thanks for the recipe, baking mixes have so many additives. I've made variations of this from Bisquick and from scratch, but this looks even better with the use of oil rather than butter in the batter. Ooh... the Red Lobster biscuits are one of my favorites, but I had only ever seen recipes using Bisquick, and I don't use that stuff either. Yours look just as good, though... if not better! My hubby would love me lots if I made these for him next week, too. I've just bookmarked this recipe - I rarely see a biscuit recipe without bisquick which I can't get here! YAY! I've never been to red lobster, but it was my grandparents favorite place to go. These look mighty tasty! I'm just torn as to whether to make these. I know they'll be so good that I'll hate myself tomorrow :) Oh, well...I'm sure it will be worth it! They look like something I need to make. Thanks! Anything that helps everyone honor the national boycott of Red Lobster and Olive Garden is always needed! You are a class act! It been a while since I've been to Red Lobster but, I remember those biscuits. These sound delicious! Pretty sure my husband will love you forever for sharing this recipe! He always asks the Red Lobster server for some to go. They have yet to say no. Oh thank you thank you THANK YOU! Im an american living in the netherlands and of course Red Lobster isnt here. I've searched high and low for a recipe that did not use Bisquick and was sooooo happy to find yours. I made them lastnight and my husband couldnt stop talking about them. Thank-you Sonya! I'm so happy you got to enjoy these. I don't typically bake, but these turned out quite nicely for me - I feel proud to have made this from scratch! 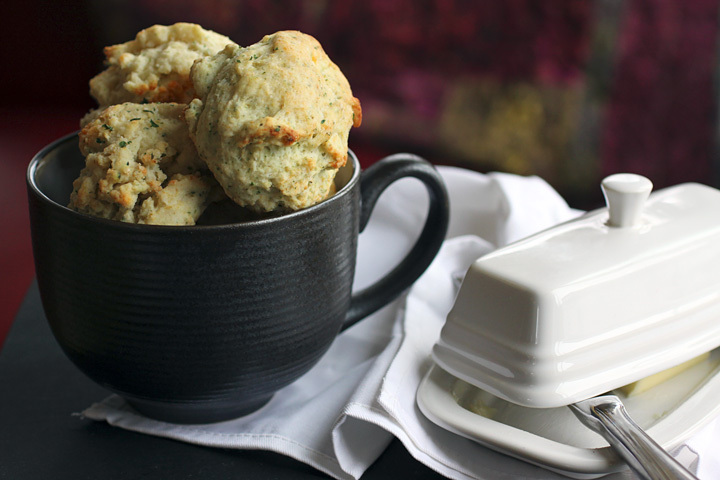 The recipe was very easy to follow and produced successful, delicious tasting biscuits for my husband and I. Thank you very much for this recipe Laura. Thank-you for letting me know the instructions were easy to follow! I am always trying to organize recipes in a way that makes them easier to get through. I'm also glad you and your husband enjoyed these. Thanks for the recipe, I wanted to try making these and we don't have Bisquick this side of the pond. Looking forward to having them with a big pot of bean stew tomorrow night! At the age of 68 and never having used Bisquick in my entire life, I confess: I have bought my first box of it this year. I've made pancakes and those glorious cheddar bisquits a couple of times and they are just as awesome as at the restaurant. At my age I need a little time off, and as I am having hand surgery soon, a way for DH to be able to make something edible for me for a change. I will defend the box here and now for those of us who are becoming more physically challenged and tired as time goes by. And yes, please do play that song, just like Rick said, "You played it for here, now play it for me". 'Cause the fundamental things do apply in life. I can respect that, but Bisquick only provides flour, salt and baking powder. The rest of the ingredient you'd have to add yourself anyway. So it's not much of a shortcut to use it. Thanks for the recipe. It tasted close enough to the real thing and we enjoyed it. Had to add extra milk to get the dough to come together though. Glad you liked it. Sorry you had to add extra milk. That surprises me, this is one of those recipes I've tested many multiple times. I made these recently and actually used 1/3 whole wheat flour (and a bit more milk because of that) and they were absolutely awesome! Thanks! I'm glad they worked out Janelle. Good idea on the whole wheat flour! I'll have to try it. These were very yummy!!! I only had onion salt so in the future if I use that I will cut back on the amount of regular salt I use. I will also make a bit more of the butter mixture for brushing over the tops. Thank you for sharing the recipe! What would happen if I used bleached all purpose flour? It's the only one i have. Also, would it work if I used american cheese singles rather than sharp cheddar cheese? You can use bleached flour and American cheese. Just chop the cheese finely and go a bit light on the amount, as sliced American cheese can be a bit gummy. Glad to see this recipe on here. Is it the real one? With the name of the site though I actually would have expected a better picture. Biscuits in a coffee mug, really? I don't eat my biscuits out of a mug. I doubt anyone does. That's NOT what I call being creative. It looks ridiculous! I love these biscuits , just like red lobster if not better. Recommend try with honey/butter on top while still warm, this is really good. Thanks for finding this recipe.